The humble, altogether simple story of "The Hobbit" becomes the grand, still relatively simple story of The Hobbit, with a smart series of additions, clarifications, expansions and only a few questionable tweaks or misguided deviations. Told in flashback (with several flashbacks within that flashback), we meet a younger, less impulsive Bilbo Baggins (Martin Freeman), the once and future ring-bearer played in his old age by Ian Holm. Coaxed by Gandalf the Grey (Ian McKellen) into joining thirteen dwarves on a quest to reclaim their kingdom and stockpiles of gold from a vile dragon named Smaug, Bilbo reluctantly embarks on an adventure that takes him from the safety of Hobbiton to the troll and orc-ridden wild, the Elven city of Rivendell, the depths of the Misty Mountains and beyond. Drawing from the original book, Tolkien's Appendices and co-writers Fran Walsh, Philippa Boyens and Guillermo del Toro's ever-evolving screenplay, Jackson's Unexpected Journey presents Bilbo as an adventurer-in-the-making in a coming-of-late-age tale, dwarf prince-turned-king Thorin Oakenshield (Richard Armitage) as a fallen hero, the unruly dwarves as nomads longing for a rightful place to lay their heads, their quest a more honorable journey, and Gandalf's frequent absences a means to a far greater end: a response to the rise of a sinister Necromancer in the stronghold of Dul Guldur. Elrond (Hugo Weaving), Lord of Rivendell, and Galadriel (Cate Blanchett) of Lothlorien return, as does Saruman the White (Christopher Lee), who isn't so willing to accept the news Gandalf and fellow wizard Radagast the Brown (Sylvester McCoy) have to share. Meanwhile, the dwarves -- among them Dwalin (Graham McTavish), Balin (Ken Stott), Bofur (James Nesbitt), Kili (Aidan Turner) and Fili (Dean O'Gorman), who receive the most screentime -- are being tracked by an old foe: Azog the Defiler (Manu Bennett), a vindictive orc chieftan who killed Thorin's grandfather before losing an arm in a battle with the dwarf king himself. But other enemies await Thorin, Bilbo and the dwarven company before the first film draws to a close. Rock giants, a trio of lumbering cave trolls, a horde of goblins, their king the Great Goblin (Barry Humphries) and, in a dank cave beneath the goblin halls, a riddle-obsessed creature named Gollum (Andy Serkis), corrupted by a seemingly harmless magic ring that grants its wearer invisibility. As with The Lord of the Rings trilogy, Jackson, Walsh and Boyens focus first and foremost on character and story, placing the utmost value on casting, performances and the ensuing adaptation above all else. Freeman isn't an A-lister (or rather wasn't before The Hobbit) but his turn as Bilbo establishes him as the film's greatest casting coup. With Freeman, Bilbo is a fully realized anchor point and unmistakably human for a hobbit. The scene in which he awakes to an empty house -- initially relieved and then, all at once, saddened by the silence -- is one of the best acted beats in Jackson's thus far four-film Middle-Earth saga, and makes everything that follows more convincing and compelling than it would otherwise be. It's these moments, these small amendments not present in the original novel but used to terrific effect in the film, that highlight the balance between performance power and adaptative craft the filmmakers make a habit of employing again and again...and again. And it's these moments that carry An Unexpected Journey through less satisfying scenes that rely a bit too heavily on CG and heightened action (the escape from Goblin Town and the Rock Giant run come to mind). The rest of the ensemble is too talented for one film. McKellen is Gandalf the Grey, and makes a number of interesting choices, from his perfectly rounded affection for Bilbo to his slight irritation at the hobbit's hesitance to strike out with the dwarves. McKellen is also responsible for yet another subtly emotional series exchange, this time with Blanchett, in a tender, easily overlooked moment of intimacy that never fails to send out chills. Armitage is excellent too, even though Thorin's disdain for Bilbo is given the spotlight a little too often. With an iron gaze and a coalfire in his chest, he helps Jackson accomplish a dramatic trifecta: infusing the film with an undercurrent of tragedy, giving Bilbo a reason to sacrifice his all for the dwarves and providing the first film with a captivating conflict all its own. The rest of the dwarvish actors, particularly McTavish and Nesbitt, fill out the company nicely and, more importantly, serve Thorin and Bilbo's arcs selflessly. And Serkis? The Riddles in the Dark sequence is engrossing, not just as a thread to Lord of the Rings but as a brilliantly staged and shot rendition of one of the book's most iconic encounters. All told, the cast is a true ensemble in every sense of the word. Jackson may not have filled the ranks with more familiar Hollywood faces, but what he nets in return is on-screen comradery, obvious even between Journey's mortal enemies. If The Hobbit stumbles on its Unexpected Journey, it's not in expanding the tale or the characters, it's in expanding the action and, to a lesser degree, embellishing the visual effects. Tolkien opposed his books being turned into action-oriented spectacles and the last act of The Hobbit, more so even than The Return of the King (which all but required such spectacle), is puffed up and a tad bloated, with whirling swords, a chase scene that goes on a full minute too long, a mountain-pass giant fight that borders on ludicrous (not the fight but the fact that the dwarves end up standing on one of the giants' legs) and a burning treetop showdown that's intense but pure over-the-top Hollywood. None of it kills the film, but it does knock it down a notch, at least in terms of storytelling. Visually, it's immaculate, packed with cutting-edge WETA effects, incredible motion captured creatures and, of course, Gollum, who couldn't look more real. Thankfully, Jackson doesn't turn to computers for every challenge. Middle-Earth is still New Zealand and the practical effects team's masterfully forged props, sets and production design in all their natural and hand-crafted glory; enhanced with CG as needed, sure, but rarely created wholesale in a computer. More to the point, everyone on the production team -- from the costume designers to the armor makers to the weapon masters to the prosthetics masters -- is an integral player in the ensemble, as much as the actors. Like The Lord of the Rings films, The Hobbit: An Unexpected Journey is a melting pot of gracious, self-sacrificing talent both in front and behind the camera. The Blu-ray edition of The Hobbit wows, dazzles and thoroughly impresses with a stunning 1080p/AVC-encoded video transfer true to Jackson's every intention. Lush, lovely Shire greens, summer-kissed browns and oranges, moonlit blues, relatively lifelike fleshtones and cavernous blacks grant the image soul and spirit. As impressive as Warner's video transfer may be, it's The Hobbit's bellowing beast of a DTS-HD Master Audio 7.1 surround track that leaves the most lasting mark. The audio is forceful yet discerning, producing deep, resonant thooms and weighty low-end support. Still awaiting an official confirmation of an Extended Edition release? Look no further than the standard Blu-ray release of An Unexpected Journey and its two and a half hours of extras. Hardly the twenty-plus hours of original or exclusive content Peter Jackson and company are known for. That said, the special features on tap at least earn their own Blu-ray disc, not because they're so significant, mind you, but so they can be presented in HD without crowding the feature film. -The Desolation of Smaug Sneak Peek Access Code: Copies of The Hobbit come with a 12-digit access code for an exclusive online sneak peek at The Desolation of Smaug, hosted live by Peter Jackson on March 24th at 3pm EST/12pm PST. -New Zealand: Home of Middle-Earth: Jackson and his team tour the lush, always stunning New Zealand countryside, revealing the locations used to bring The Hobbit's Middle-Earth locales to life. -Video Blogs: Ten Jackson-helmed online video blogs are available, documenting (but primarily teasing) the production of the then-upcoming theatrical release of An Unexpected Journey. Two hours of content is much appreciated, don't get me wrong. But, excellent, informative and entertaining as they are, the blogs are bound by rules full-fledged production documentaries have the freedom to discard at the outset. Arriving before the film debuted, the blogs' chief goal was secrecy, making them more of an extended two-hour promo for the film than anything more extensive. -Trailer: Six full and alternate Unexpected Journey trailers. -Game Trailers: Kingdoms of Middle-Earth, Guardians of Middle-Earth and LEGO LOTR. Debate will continue to rage as to whether The Hobbit: An Unexpected Journey is a worthy precursor and rightful successor to The Lord of the Rings trilogy. Whether it's a faithful adaptation or goes one step too far. Imbues the spirit of Tolkien or tramples on his grave. Some will continue to criticize, some will continue to praise. But few can deny Jackson's passion for the material, his team's mastery of their craft, the strength of the ensemble's performances or the various strides the film makes in its own unexpected journey toward becoming a full-fledged trilogy. The film's flaws are minimal in the grand scheme of things and its future installments are ripe with promise. Here's hoping the next two Hobbit films will go one step further and take their place at The Lord of the Rings' side. Thankfully, Warner's Blu-ray release is an excellent one. 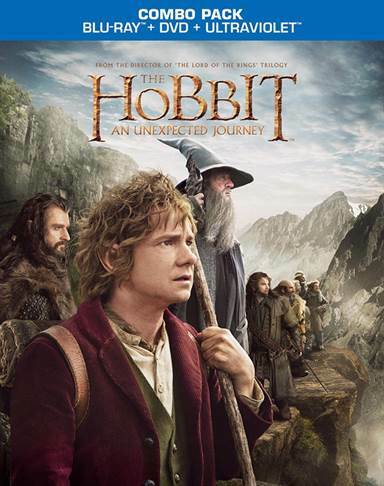 Download The Hobbit: An Unexpected Journey from the iTunes Store in Digial HD. For more information about The Hobbit: An Unexpected Journey visit the FlickDirect Movie Database.